Lemon Pepper Chicken - This chicken is CRAZY delicious! Only 5 ingredients! SO simple! olive oil, lemon juice, Worcestershire sauce, lemon pepper and salt. The chicken is so tender and juicy. It has TONS of great flavor. We like to double the recipe for leftovers. 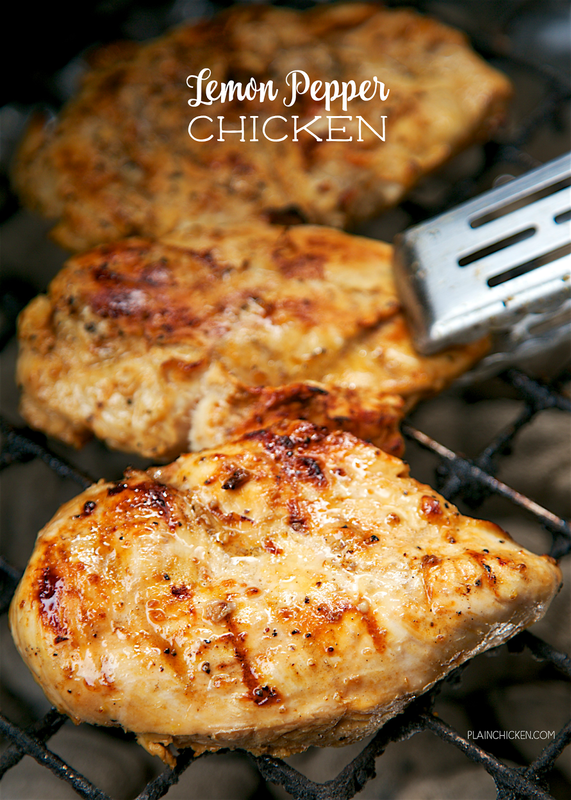 Everyone loves this easy grilled chicken. Lemon Pepper is one of my favorite flavor combinations. I love the tangy kick! This Lemon Pepper Chicken is fabulous! SO good! It smelled incredible while it was cooking on the grill. I couldn't wait to taste it. It tasted better than it smelled! I don't know how that was possible, but it was! 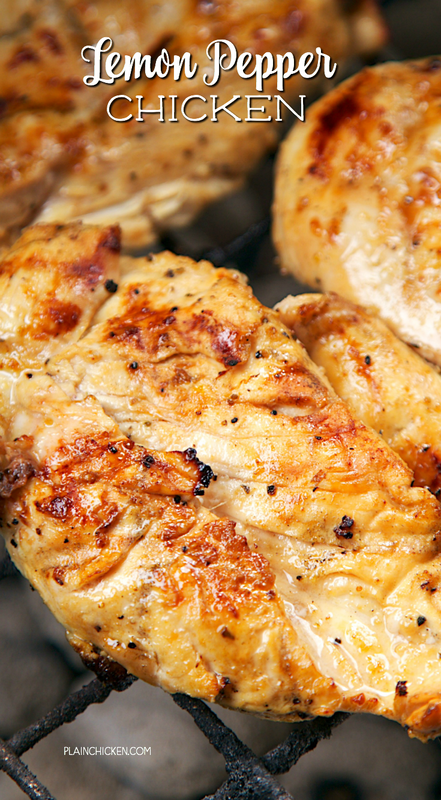 This Lemon Pepper Chicken only has a few ingredients and is ready for the grill in about an hour. Unlike most of our other chicken marinades, this one doesn't need to sit overnight in the fridge. The lemon juice will break down the chicken and make it mushy. Boo! It only needs about an hour to get great flavor. 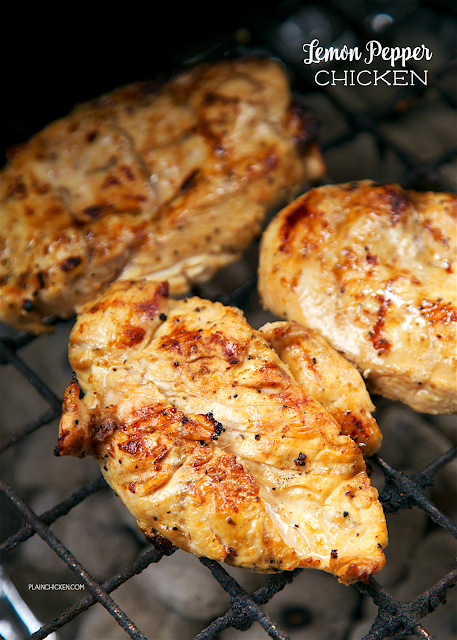 Throw this on the grill for a quick, easy and CRAZY delicious chicken. We like to double the recipe for leftovers. It is great on a salad or in a quesadilla. Whisk together oil, lemon juice, Worcestershire sauce, lemon pepper and salt. Pour over chicken and marinate in the refrigerator for 1 hour. Remove chicken from marinade and grill for 15 to 18 minutes, until no longer pink. I love that this only requires an hour -- I can't ever seem to get things together enough to marinate overnight. This is perfect! Tried this yesterday and it was delicious!!! I panicked as I realized later I had not pinned the recipe and spent a good part of my day looking for it again. IT IS THAT GOOD! I had a lemon pepper combo spice from PURE that was perfect!! I like to cook them in an oven safe skillet for 3 or 4 minutes per side and finish them off in the oven at 425 for about 10 minutes. Enjoy!! How long do you cook the chicken if you are cooking in a pan on the stove?